From Dr. Amanda Strayer-Scherer (Postdoctoral Research Scholar, Plant Pathology, Tomatoes), and Inga Meadows (Extension Associate, Plant Pathology Specialist). Background: The information presented in this vegetable production update contains a summary of the details discussed in the one-hour, biweekly vegetable production conference calls entitled Veggie Calls. These open forum sessions were developed to allow extension personnel (agents, area specialized agents [ASAs], and specialists) to discuss challenging cases, seek advice on recommendations, report emerging issues, and share training opportunities related to vegetable production. These calls are hosted by Inga Meadows, Dr. Amanda Strayer-Scherer, and/or Dr. Lina Quesada-Ocampo every two weeks throughout the vegetable production season. Attendees (description) of the September 28 Veggie Call: Inga Meadows (Extension Associate, Vegetable and Herbaceous Ornamental Pathology) and Amanda Strayer-Scherer (Postdoctoral Research Scholar, Plant Pathology). Downy Mildew was reported on greenhouse cauliflower seedlings in Western North Carolina. N.C. Cooperative Extension Conference November 14 to November 16, 2018. This is an N.C. State employee development conference for extension agents, county extension directors, specialists/extension associates, and administrators. For more information, see the event page. The final Veggie Call of the 2018 Vegetable Production season will be on October 12 from 2 to 3 p.m. Explained to the group that we plan to publish summaries of the Veggie Calls with important pest information in the NC State Extension Pest News and will keep track of the names of the attendees to give them credit in the published summaries. These published summaries will be accessible to vegetable producers, ASAs, county extension agents, extension specialists, and researchers with an interest in North Carolina’s vegetable production industry. REMINDER TO AGENTS: Sign up for NC State Extension’s Pest News and Pest Alerts so you will know when late blight and downy mildew appear in your county(ies) and to stay updated on other production issues. Amanda Scherer (Postdoctoral Research Scholar, Plant Pathology): Amanda is a new postdoctoral research scholar with Inga Meadows at the Mountain Research Station in Waynesville, NC. Part of her research is to look at the pesticide sensitivities of the bacterial spot and early blight of tomato pathogens. For bacterial spot, they are focusing on tomato transplant producers and are asking for help from extension agent in collecting greenhouse tomato samples with bacterial spot symptoms. 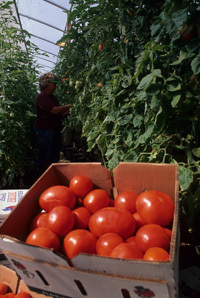 For early blight, they are focusing efforts on collecting tomato samples with early blight symptoms from commercial fields in North Carolina. These samples will help provide us with valuable information on how to better advise growers in North Carolina to manage these two diseases. If you are interested or available to help them with this project, then they can send shipping labels and simple instructions for collecting samples. Please contact Amanda (alstraye@ncsu.edu) or Inga (inga_meadows@ncsu.edu) for more information. Downy Mildew of crucifers caused by the fungus-like, oomycete pathogen Hyaloperonospora parasitica. The pathogen can infect cabbage, brussels sprouts, broccoli, cauliflower, kale, kohlrabi, Chinese cabbage, turnip, radish, and mustard in addition to cruciferous weed species. Heavy fogs, light rain, prolonged dews, a nightly temperature of 42-61°F, and day temperatures below 75°F favor disease development. The pathogen can overwinter on winter-sown host crops and cruciferous weeds, crop residues, and the soil. Signs and Symptoms: Small, angular lesions will develop on leaves. As lesions enlarge, they become irregular, yellow to orange necrotic patches Under surfaces of leaves become covered with white to grey or purple, fluffy spores (“downy” appearance). Management: Remove crop debris and weed hosts to reduce inoculum. Rotate with non-brassica crops and reduce humidity by providing good aeration in plant beds and not using overhead irrigation. For the latest fungicide recommendations for basil downy mildew see the Southeastern US Vegetable Crop Handbook. Fungicide labels are legal documents, always read and follow fungicide labels. Brassicas, Downy Mildew. 2013. University of Massachusetts Extension fact sheets. Retrieved October 3, 2018. Kucharek, T. 1985. Downy Mildew of Crucifers. University of Florida Plant Pathology Factsheet. Retrieved October 3, 2018.